The RGM Watch Company announces immediate availability of Series 2 in a limited release. This second series, known as 300-2, comprises 100 examples with a very special set of blue color options appropriate to exploring the deep blue sea or the wild blue yonder. On the new Model 300-2, a brushed blue bezel insert replaces the standard black one and immediately attracts the eye. To complement this change, two blue dials are also available—the first is matte blue single-sunk, based loosely on the original matte black version. However, this Series 2 blue dial includes some interesting design changes. The hour markers do not extend into the sunken portion of the dial, and the date window can be placed at either 3:00 or 6:00. The hue of the matte dial exactly matches that of the bezel, creating a multi-layer effect that is striking. A second dial option is Sunray Blue—a dynamic, metallic finish that reflects varying shades of blue depending upon the angle and the available light. This is also available with the date placement options described above. Even in low light, the 300-2 adheres to the blue theme; though the hands and markers are treated with white SuperLuminova C1, it emits blue light. The hands are partially skeletonized; another subtle change from the Series 1 black Model 300. 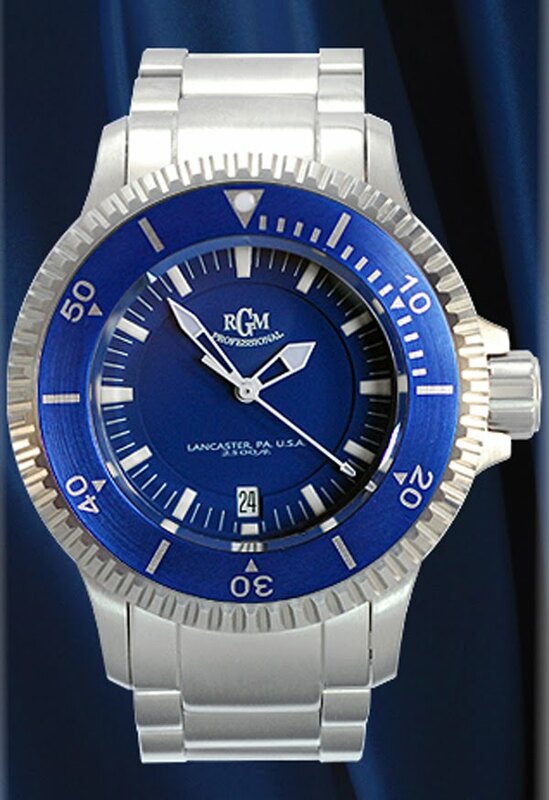 As with all RGM Professional watches, the blue Model 300-2 will be of sturdy construction: water resistant to 2500 feet, made of high-quality steel, and available with steel bracelet, or with silicon straps of blue or black. Custom options are also available—as on all RGM watches—including mother-of-pearl dials or personalized engraving. Dial: Option of a Matte Blue or Deep Sun Ray Blue Finish. Date: Option of No Date , Date at 3:00 or Date at 6:00. Strap: Black or Blue Rubber Strap.